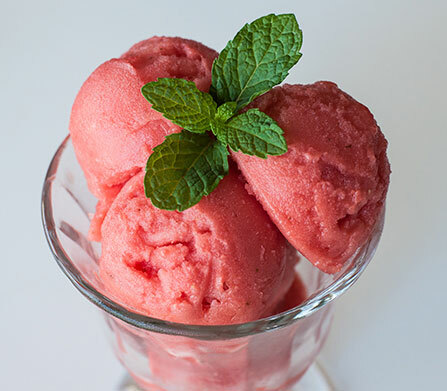 Watermelon and Strawberry Sorbet - What About Watermelon? Perfect treat for a hot Summer’s day that can be easily prepared in just over five minutes. Prepare your ingredients by cutting seedless watermelon into cubes (enough for five cups) and measuring out other ingredients. In a large saucepan, combine water and sugar over medium heat. Using a whisk, stir mixture continuously until it begins to boil. Turn the heat down and allow the sugar and water to simmer until the mixture becomes transparent (approximately 4 minutes) . Once transparent, remove from element and set aside. 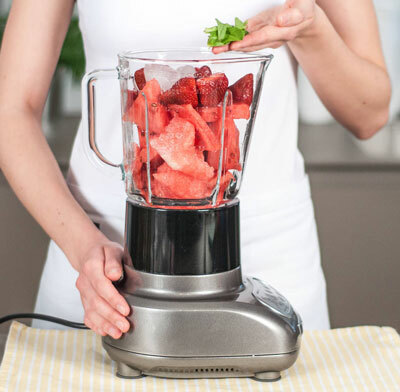 In a blender or food processor, combine watermelon, strawberries and mint and blend until mixture is smooth and free of lumps. In a bowl using a wooden spoon, combine the melon/berry mixture with the warm sugar/water mixture. Once combined, you can eat as is or alternatively spoon this mixture into a clean ice cream container or a plastic lidded container and chill in the freezer. After an hour and a half this mixture will be chilled and ready to serve.